Western Range: Northeast Siberia, Commander Islands, Bering Sea, Aleutian Islands, inland Alaska, and south to Wyoming and California; Eastern Range: Iceland, Greenland, Labrador, as far south as New Jersey. Breeding season is spent in cold, rapidly flowing streams often surrounded by forest, and winters are spent inshore marine waters, rocky shores, and reefs. The Eastern Canadian population is endangered, the Maine population is listed as threatened and the western population is listed as a species of concern. The populations in Prince William Sound were severely impacted by the Exxon Valdez oil spill due to oil in their diet. Males: slate blue body; white bands and collars, bordered with black lines, on chest and neck; large white crescent in front of eye; small white circular patch near ear; white vertical stripe along side of neck; black streak, bordered by white and amber lines, on top of head; iridescent blue secondaries; rich dark-slate-blue belly; chestnut-brown flanks. 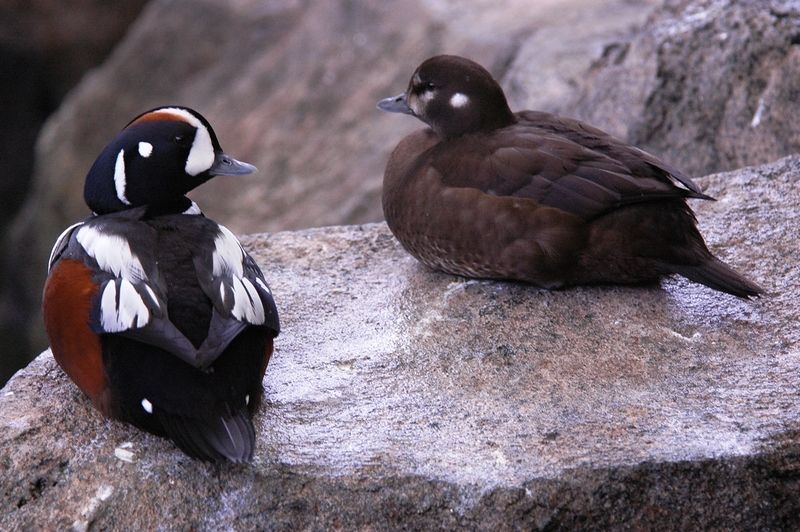 Adult female: brown body plumage; white belly, with brown checks or spots; round white spot behind ear. Clear, fast-flowing rivers and streams for breeding. They are able to move swiftly and with great agility in turbulent white water, diving to the river bottom to pick larval insects from rocky substrates. After breeding, individuals migrate to the coasts of North America and Greenland, where they occupy the shallow intertidal zones of rocky coastlines. Krill and herring eggs are some of their favorite diet items.